The UPS and inverter both provides the backup supply to the electrical system. One of the major difference between the UPS and inverter is that the switching of UPS from the main supply to the battery is very immediate whereas in inverter the switching from mains supply to battery takes times. The UPS and the Inverter are differentiated below in the comparison chart by considering the various other factors. The abbreviation of the UPS is the Uninterruptable Power Supply. The UPS has a battery which supplies the power during the power outages. It provides the power for a short duration so that data can save before the complete shutdown of the system. The inverter inverts the direct current to an alternating current. It takes the supply from the AC source and charges the battery. During the power cut, the inverter receives the supply from the battery and provides the power supply to the electrical equipment. Definition The UPS is an electrical device that provides power to the load when the main power fails. The inverter converts the unidirectional current into bidirectional. Function Act as a flywheel storage system Main function is to convert AC power to DC power. Types	 Offline, Online, Line interruptive or Standby UPS. Stand Alone and Grid Tie Inverter. Connection Directly connected to the appliances. It is connected to the battery and appliances. Use For domestic and industrial use. Only for Domestic Use. The UPS allows the power to flow through the system so that the data can be saved before the primary supply is fully shut down. It also protects the system from power surges. The UPS has a battery which comes in contact with the power supply of the devices when it senses the power loss from the main supply. Their circuit consists the inverter, battery and the controller. The UPS converts the AC to DC by the help of the rectifier and again converts the DC power into AC power by the help of an inverter. The block diagram od UPS is shown below. The basic feature of the offline/standby inverter is to provide the backup power and protect the system from the power surges. The line interruptive UPS is also known as the standby power system. The line interruptive UPS has variable voltage transformer which adds or subtracts the power coils of wire. In online double conversion UPS, the battery is always connected to the inverter due to which no additional power transfer switches require in the circuit. The inverter is an electronic circuit that changes the DC to AC. It does not generate electric power; the power is supplied from the battery. The input voltage of the inverter is the constant DC power source, and their output may be square, sine or pulse sine wave depends on the circuit and design of the inverter. The frequency of the output wave of the inverter remains same as that of the standard frequency, i.e., the 50 or 60 Hertz. Their runtime depends on the power of the battery. If the number of devices using the inverter increases then their running time will decrease. For improving the runtime of the inverter number of batteries are used for storing the DC power. The Stand Alone inverter is the basic type of inverter which converts the DC into AC. The output of the stand-alone inverter is the sine wave, but sometimes because of distortion, their shape may disturb. The grid tie network supplies the AC power to the large grid of the power system. The inverter does not store the electrical energy. For storing the electrical energy, the battery is used. The battery stores the energy in the form of the DC. The inverter helps in storing the AC power coming from the source in the batteries. The battery stores the current in the form of DC which is again converted into AC with the help of inverter and supply to the home appliances. The conversion is required because the electrical equipment works on AC power. The UPS is the electric device which has rectifier for providing the backup power to the system whereas the inverter converts the AC into DC. The main function of the UPS is to store the electric supply whereas the inverter converts the AC power into DC power. During the power outages, the UPS immediately switch over from the main supply to the battery whereas the inverter has a time delay. The UPS provides the electrical backup power, and the inverter provides the electronics backup power supply. The Offline, Online and Line Interruptive are the types of the UPS whereas the inverter is of two types, i.e., the standby inverter and Grid tie inverter. 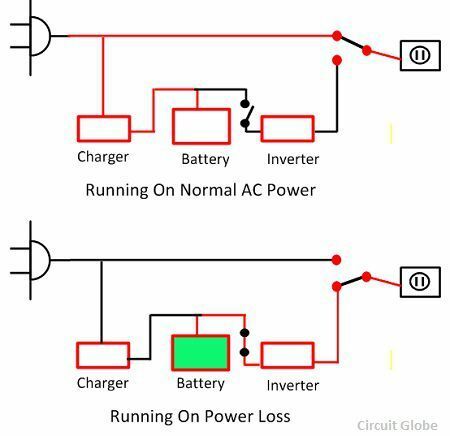 The UPS is directly connected to the home appliances whereas the inverter is first linked to the battery and then attached to the appliances circuit. The UPS is more expensive as compared to the inverter. The rectifier and battery are inbuilt in the circuit of UPS. The rectifier converts the AC into DC and stores the energy into battery whereas the inverter has an external battery for storing the DC power. The UPS provides the backup supply for very short duration whereas the inverter supplies the power for an extended period. The UPS does not have voltage fluctuation because their input is independent of the output supply whereas the inverter has voltage variation. The UPS is used for the domestic purpose, in offices and industries whereas the inverter is used in the office. The UPS is more efficient as compared to the inverter. The UPS provides the electric backup to the appliances without delay and fluctuation. And, the inverter is a medium between the primary power supply and the battery. The battery helps in storing the energy and during the power outages convert the store AC into DC and provides power to the electrical inverter.